Easter is out of the way, all the holiday makers have gone home, it’s time to go fishing. 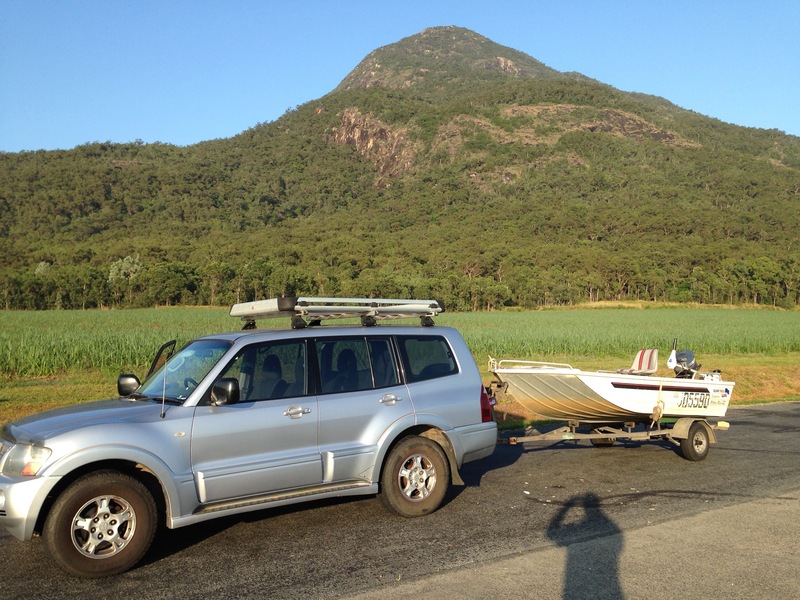 Hitched up the tinny and headed off down the highway, the radio said it was already blowing 27 knots out on the reef. Not to worry, where I fish I get some protection from the riverbanks. The river was down a bit, so heading into the upper reaches was out of the question (lost a prop last week for that very reason). 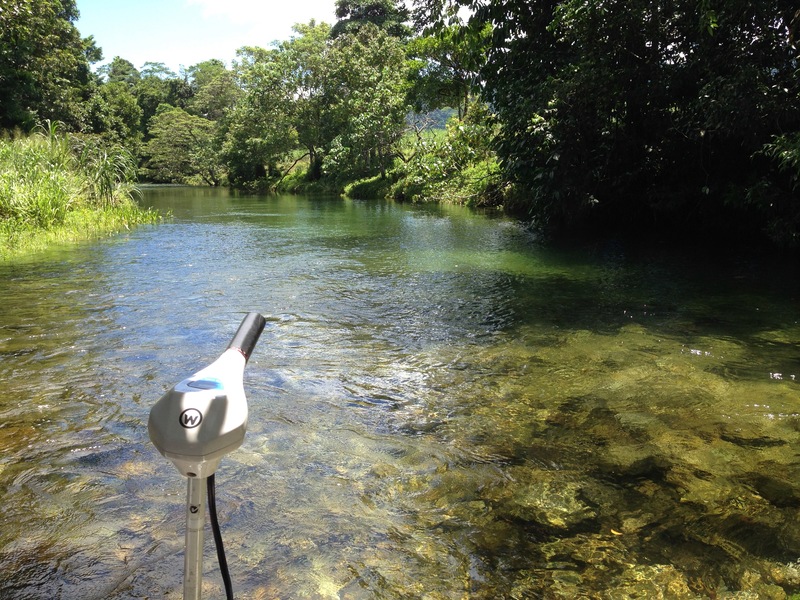 The river had cleared up, it had been very silty due to the rains. So after navigating my way over all the usual snags that were closer to the surface now I pulled up and began fishing. Started with my go to lure the Rapala SR5 Bluegill, it took around ten minutes before I had my first bit of interest, it was going to be a quiet day. Still twenty minutes in and I hadn’t landed a fish, worse still I’d hardly seen a fish. Time for a change of tact, a green and orange popper, let’s see how we go. Nothing, for another ten minutes, it’s going to be a long day. Was just about to retrieve my lure when something caught my eye on the other bank, then bang, a hit, looked back and there’s a massive Barra sitting on the surface, we did the dance for less than 30 seconds, a couple of jumps but a pretty lacklustre fight, I thought I had pressure on him when the lure just fell out of his mouth, even the Barra was unsure as he jumped again to try and throw the lure, then he swam back off into the deep water. Bugger, but a least I’d seen some action. By this time it had started to cloud over making the popper my preferred method of attack. 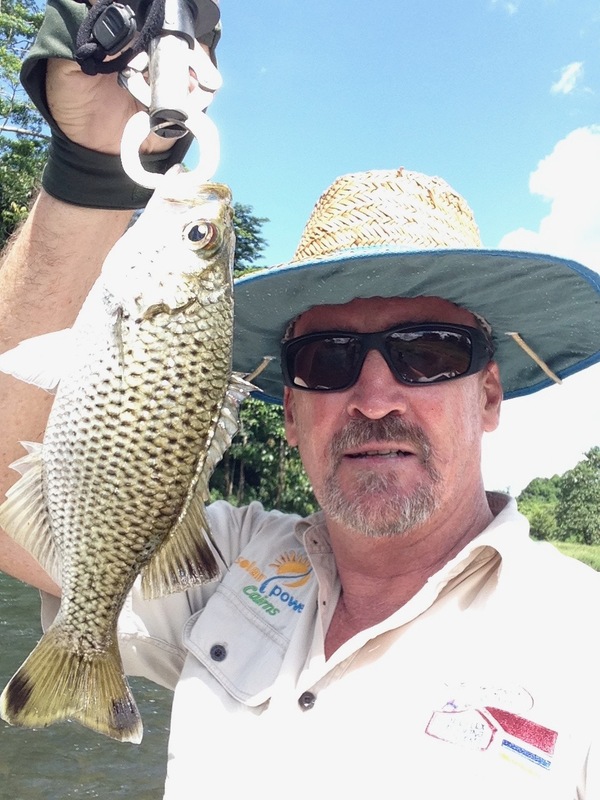 First up was a nice little Sooty, followed by a Jungle Perch, two more Sooty’s then a nice Barramundi, the morning was looking up. A bit later I jagged a small Mangrove Jack, and to my surprise just after that as I was bringing in my popper on a fast retrieve to get another cast in, and the line started singing, luckily I was in a wide part of the river with no snags as this thing nearly made the other bank, about fifty metres away, you guessed it, a marauding Trevally, after a nervous fight I managed to land it, all the time aware of the light gear I was using. It dawned on me I was one fish short, again, of my Holy Grail. 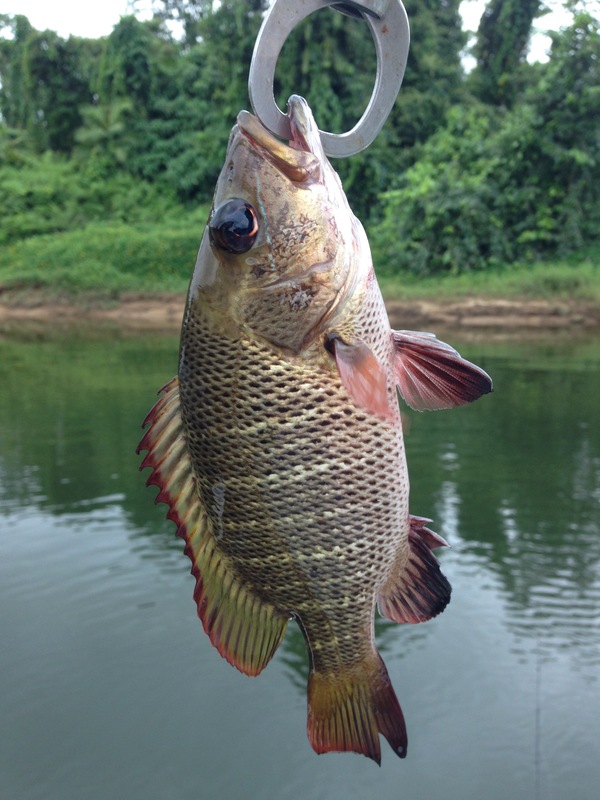 A Barramundi, Jungle Perch, Mangrove Jack, Sooty Grunter and Tarpon, all great sport fishing species. But alas, time was getting on and I decided it was time head home, cruising home I turned a bend a came across a known Tarpon habitat, it can’t hurt to have a few more casts before I head off. 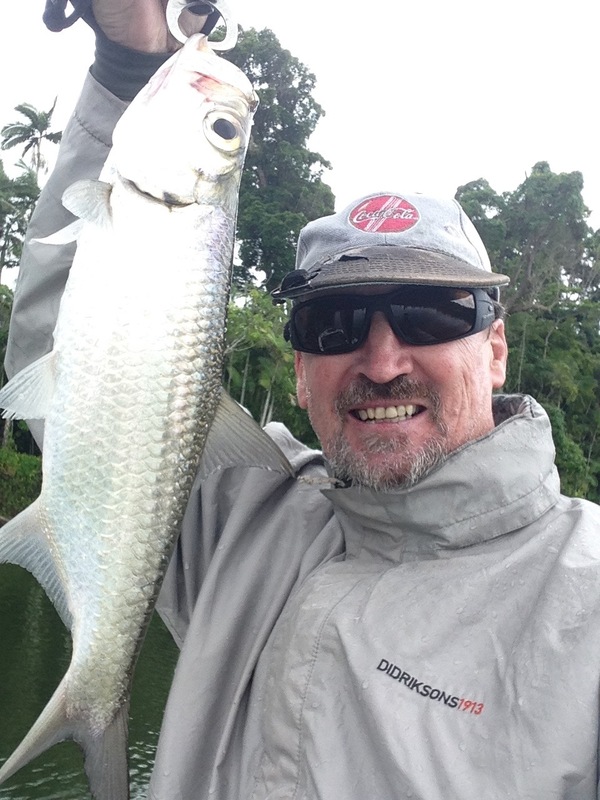 A shower of rain came across dampening my enthusiasm as Tarpon tend to lurk in the deeper pools and the lack of light may make a strike considerably less likely. Anyway, one last hundred metre stretch of river then I was done. Around cast number six I got a flash, yes there’s a chance, peppered that spot for a while with no result. I bagged a Sooty about ten casts later. Then bang, I was on, the Tarpon showed itself and the battle was on. Tarpon are notorious, in my experience, for throwing lures with their aerial acrobatics. After a very nervous fight I lifted the spent fish into the boat and celebrated my triumph of achieving the Holy Grail, my Holy Grail anyway. 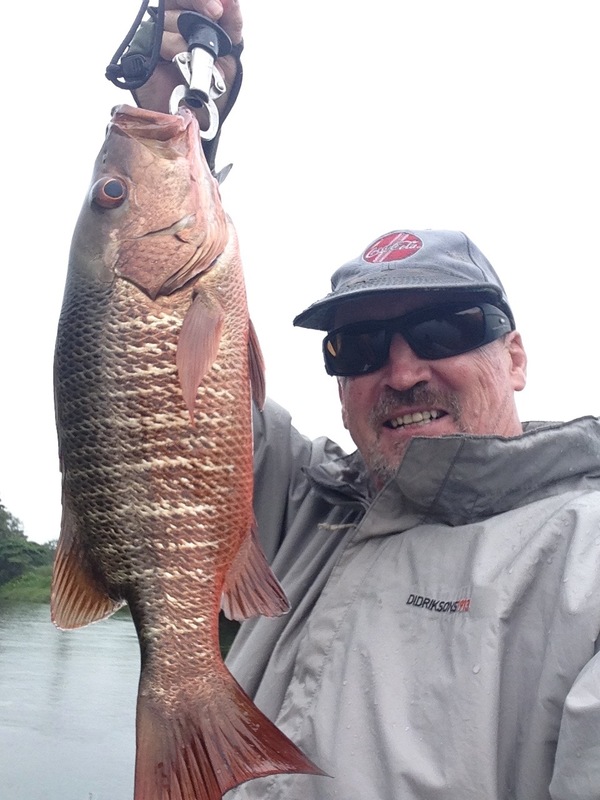 Not a bad days fishing afterall….